Researchers have created a new type of microtweezer capable of manipulating objects to build tiny structures, print coatings to make advanced sensors, and grab and position live stem cell spheres for research. Ever wish you had teeny tiny tweezers to pull a teeny tiny splinter from your pinky? Researchers have developed easy-to-use "microtweezers" that are up to the task, and much more, such as plucking a cluster of stem cells from a petri dish and building all sorts of little mechanical devices. The tool consists of a thimble knob, a two-pronged tweezer made from silicon, and a system that converts the turning motion of the thimble knob into a pulling-and-pulling action to open and close the tweezer prongs. "You just turn the thimble one way and it closes [the prongs] and the other way around it opens," Cagri Savran, a mechanical engineer at Purdue University, explained to me Tuesday. That's simpler, he said, than other microtweezers that, for example, require an electrical power source to operate and intricate parts to enable magnetic or electro-static actuation to grip and move objects. 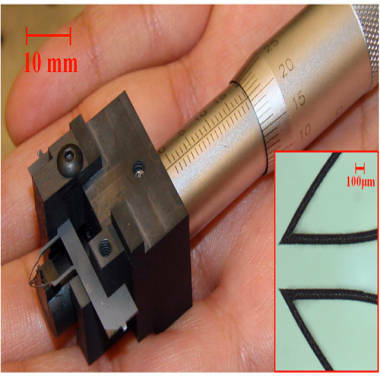 He and his colleagues described the tweezers online December 2011 in the Journal of Microelectromechanical Systems, or JMEMS. MEMS are a class of devices that range in size from about 1 to 100 microns, with some sort of mechanical and/or electrical properties, Savran explained. A human hair is about 75 microns wide. The prong component of his microtweezer — "that part that can grab on to the particle," as he put it — is a MEMS, which is why its development was published in the journal. The new microtweezers might be used to assemble structures in microelectromechanical systems, or MEMS, which contain tiny moving parts. 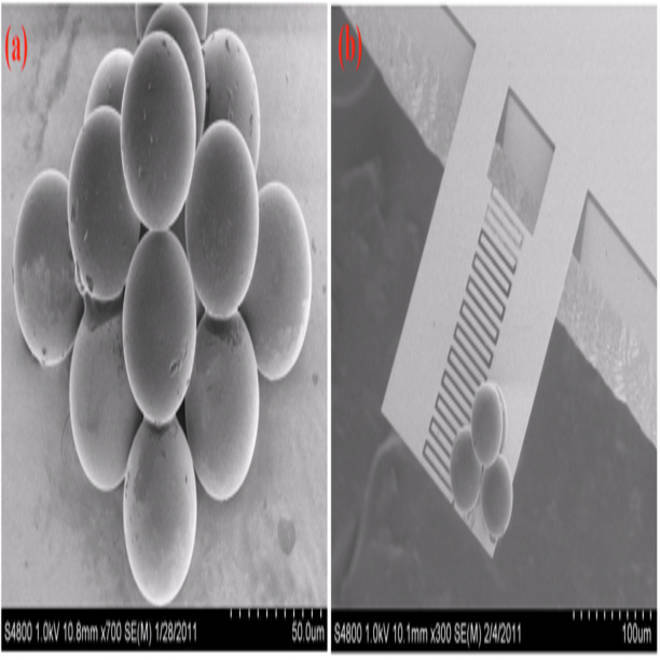 The researchers have shown how the device can be used to assemble tiny polystyrene spheres, each with a diameter of 40 micrometers, at left, into three-dimensional shapes. The device also might be used to weigh tiny particles by placing them onto the tip of a structure called a microcantilever, at right. According to Savran, the microtweezers allow you to do all kinds of things in the microworld that you already do in the macroworld, such as move around objects. Only now, you can move them to build all kinds of MEMS. The tweezers can also be used to grip a tiny paint brush for really small paint jobs, such as coating chips with proteins used detect chemicals in the air or water. What's more, they can be used to pluck out clusters of stem cells, called spheres, from a culture media for experiments. "You can target just one … pick that one up and keep the other ones in the culture so they keep living in there," Savran said. All of these potential uses were demonstrated in the lab by moving around 40-micron-wide polystyrene spheres as well as painting tiny beads with a fluorescent coating. The team hopes to start a company to manufacture and sell the microtweezers. While a price isn't set for the tool, Savran said they'll "be much cheaper than anything else" available. So, next time you're in the market for some nifty tweezers, you might want to check out these. John Roach is a contributing writer for msnbc.com. To learn more about him, check out his website. For more of our Future of Technology series, watch the featured video below. Architect James Carpenter explains the surprising versatility and infinite usability of our friend, glass.